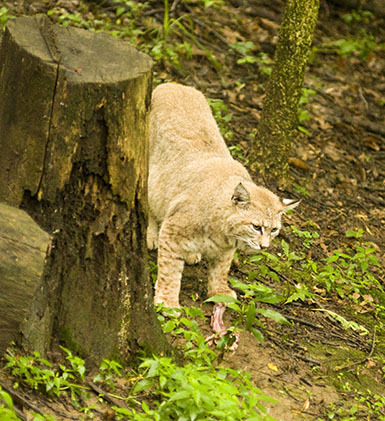 It’s time to close this month out and I cannot think of a better way than displaying some wildlife pictures. A few weeks ago, Linda and I headed out for a day of shooting at the Wildlife Prairie Park. We happen to be members at this park which is located just outside of Peoria in the small town of Edwards (about 15 minutes from our house). This park puts the residents in their natural settings with plenty of room to move and live out a fairly normal animal life in spite of the numerous visitors that come to admire their beauty. It caters to the typical wildlife found on the Midwest prairies (this includes the historical perspective). They have a nice heard of bison, a few cougars, looks like down to one bear, a few foxes, otters (although I can’t remember the last time they were actually out in view), a badger and two coyotes to name a few. But most impressive of all, they have one of the best wolf packs I’ve found outside of the International Wolf Center in Ely Minneapolis. Linda and I have traveled to many states to check out their captive wolves and always end up being disappointed because they never compare to what we have in our own backyard. I’ll be rolling pictures of the wolves out soon enough, but today’s post focuses on another inhabitant of the park. 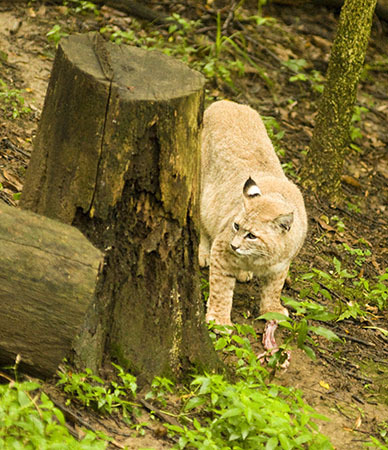 For the uniformed city dwellers out there, this is your classic bobcat. Half kitty cat, half cougar and 100% kill you when you least expect it. Basically look at it as a house cat skin covering of pure muscle that enjoys nothing more than to gnaw the flesh off of crunchy bones. We happened to catch this particular beast at feeding time. I really liked the contrast of the dead tree with the living animal and the brightness of the coat against the dreary setting. It was very apparent this cat was nervous about someone messing with his catch and spent the entire time we were was watching him checking back and forth for any suspicious activity. The interesting thing about this set of shots is the opportunity it gives to experiment with different cropping options. Cropping is an art unto itself and one of those activities you can spend a day on just exploring the different configurations and the effect it has on the viewer. In this set, I tried to let the cat drive the crop orientation. In the shot above, the cat was clearing the upper left of suspicion so the crop was skewed in that direction. 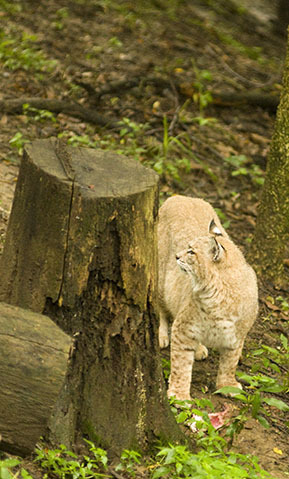 In this shot, the cat is checking if anything was lurking on the other side of the stumps. To compensate for this new direction, the crop was brought down from the top and extended in the direction of the area being scanned. At first I had the cat pushed closer to the right side to hit the rule of thirds, but it just felt like the cat was too confined in the scene. I actually really like this shot since you can see more of the facial features and the concerned expression seemed to fit the situation perfectly. Lastly, the subject gave a final inspection down the hill. As before, the crop was adjusted to compensate for this new scan direction. After debating for awhile and trying a few options, it was decided to sacrifice some of the stump in favor of the extra shift it provided to the left. The stumps provided a nice anchor to the left side of the shot, but unfortunately it did put the focus of the photo too much in the center for my liking. It would have also helped if the living tree wasn’t shooting right out of his head but I had to take what nature provided. Although this one really shows off the strength of the muscles these animals have, my favorite is still the middle one and likely the one I’m going to send out for production print. I hope you enjoyed my little crop experiment. If you get the chance, be sure and visit the park. You will not be disappointed! Just be sure and bring your longer glass and a full bottle of Off. Next Next post: I’m Feeling a Little Smug Today!